This one was coming: Southern California homebuilder John Laing, which has been pretty mum amid plenty of damning reports, has filed for Chapter 11. Bloomberg News reports that WL Homes LLC, which owns John Laing Homes, filed Chapter 11 documents today in U.S. Bankruptcy Court in Wilmington, Delaware. Via the newswire: "Irvine, California-based WL Homes, which also does business as John Laing Homes, traces its history to 1848, when its predecessor was a homebuilder in the U.K. WL Homes was formed in 1998 when John Laing merged with Watt Homes, according to court documents." According to the filings, the company blamed the collapse of the real estate market and listed assets of more than $1 billion and debt of $500 million-http://www.johnlainghomes.com/indigo $1 billion. 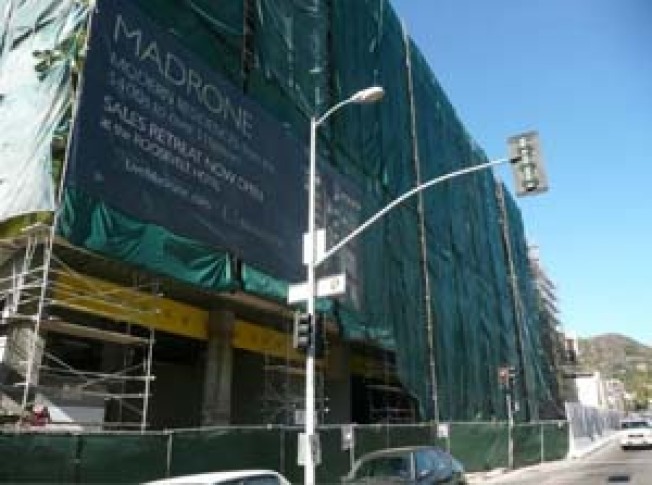 Last month, the company stopped work on the Hollywood Madrone, that 180-unit condominium development at the corner of Hollywood Blvd. and La Brea Ave. The company is behind the Element (pictured) and Indigo in the Marina Del Rey arts district, both of which are completed. According to John Laing's web site, there are three units left in Indigo. Element also has sold some units, but it's not clear to us how many have moved. Additionally, the company is behind Icon project in Playa Vista. Stopping by Icon last weekend, we were told by a sales rep that only four units are left for sale in the development. The sale agent doesn't keep regular hours and is available by appointment only. Additionally, Emaar Properties ownsBeverly West, that under-construction luxury condominium rising on Wilshire Blvd. Last month, real estate agent Brian Adler, who is representing the project, told us that Emaar Properties directly controls that project, rather than John Laing. It's not immediately clear what's going on with that project.